Oceanfront cottage with 200 feet of private pebble beach with beautiful view of Western Bay and mountains of Acadia National Park. Situated on 3/4 acre, this cottage is conveniently located in a quiet, wooded setting yet only 10 miles to Acadia National Park and 12 miles to Bar Harbor. Cottage has 2 bedrooms, living room, bath room, kitchen with modern appliances, and small breakfast sun porch. From the sun porch or deck, enjoy sunrise over the mountains or the beauty of the moonlight on the water. Amenities:Electric heat, wood stove, telephone. Please No Pets. No Smoking. Activities: Swim, kayak, walk, bike, or just sit and read a book on the private beach. 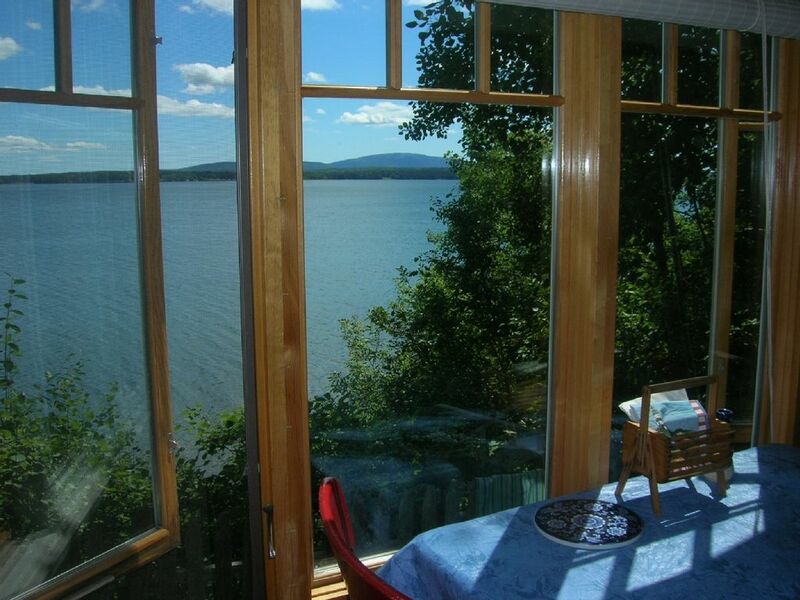 Area: Conveniently located between Ellsworth and Bar Harbor, directly on the shore. Dining, shopping, whale watches, nature cruises, hiking or biking in Acadia National Park. Bob and Pat are recently retired. We enjoy sharing our special place in Maine with guests. We love the peace and quiet on our 200 feet of private beach. We love the view across the bay to the mountains of Acadia National Park.We love watching the sunrise from the sun porch and the moon on the water at night. And we love watching to see a glimpse of seals in the bay. 200 feet of private beach; no lifeguard; swim at your own risk. Mountains of Acadia National Park are about 10 miles from the cottage. Mountains of Acadia National Park visible across the bay in front of the cottage. Electric baseboard heaters in each bedroom and living room; small supplemental heater in living room. Cottage is seasonal and uninsulated. Dining area is on the enclosed sun porch with water view. Sheets and towels are not included in the rental rate. However, they can be provided at modest added cost for guests who cannot bring their own.